Birdsong Princess Alexandra "Lexi" was born on May 30, 2014 and will be celebrating her 4th birthday this spring. 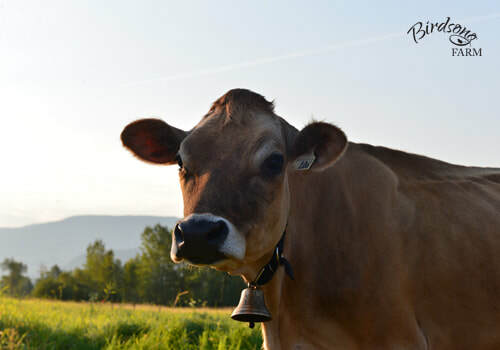 She is part of my "Princess" cow family and was named after Princess Alexandra, The Honourable Lady Ogilvy (the youngest daughter of King George V and Queen Mary). 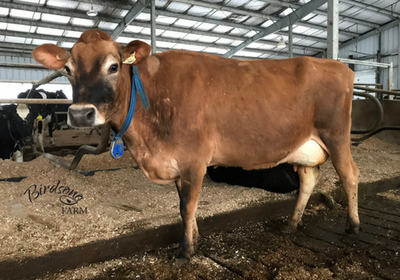 Lexi is a lovely mid-size Jersey (49.5 inches tall) and will make an excellent family cow. 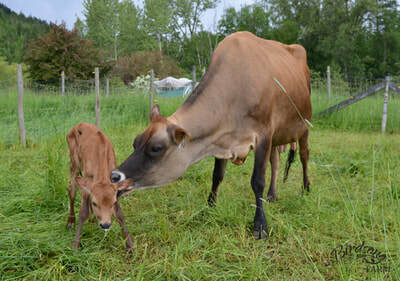 A newborn Alexandra with her mum, Sonja. Newborn Alexandra hiding in the grass at the end of the pasture. Alexandra (left) and her older sister Grace on the dry cow pasture this past summer. Naomi and Alexandra. You can see she's a total sweetheart! 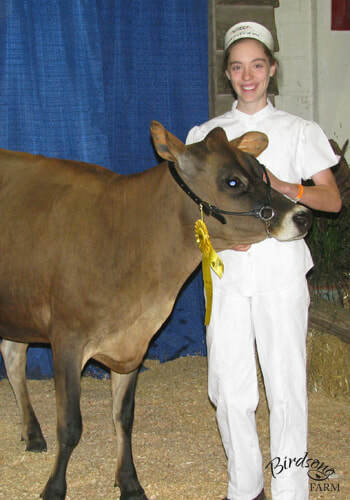 Pedigree: Alexandra is a granddaughter of my first purebred cow, Princess, and is a registered purebred Jersey; please click here to view her pedigree from Jersey Canada. ​Alexandra's sire is GILLARD PANCHO GP 84. Pancho is a HealthSmart™ bull from Semex. 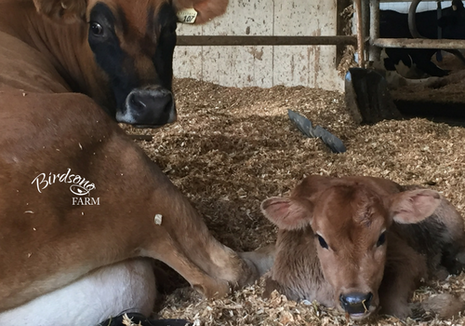 Daughters sired by HealthSmart™ bulls have smaller body size, higher fertility, longer productive lives, increased mastitis resistance, higher feed efficiency, and better body condition than their herdmates. Her dam is BIRDSONG PRINCESS SONJA VG 85. Alexandra is the second of Sonja's four daughters, and at 4.25% her inbreeding percentage is within the recommended 7% or less. Offspring: Alexandra's first calf, BIRDSONG PRINCESS ZARA, was born on July 9, 2016 and her second calf, BIRDSONG PRINCESS MARINA, was born on October 7, 2017. When breeding Alexandra, I highly recommend that you look for a bull with excellent udder traits (softer udder texture with added height and width to the rear, a strong median suspensory, and a better fore attachment), additional dairy strength (increased chest width and body depth), a good rump (increased pin width and loin strength), and straighter rear legs. 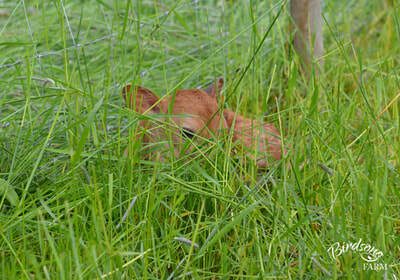 Alexandra has white in her pedigree, so don't be surprised if any of her calves are born with white markings. The foundation cow of my Princess family is Gaymar Just A Princess, the granddam of Alexandra. In Princess' pedigree there are two crosses to Master C Tops (3rd generation on the maternal and 4th generation on the paternal side) and a cross to Spruce Vine Surv Knight (3rd generation on the maternal side); these two bulls were known for their white markings. Milk: Alexandra has three working quarters. Her right rear quarter was light when Zara was born, and was completely blind after Marina was born. There is nothing wrong with her other three quarters. Alexandra has been machine milked (both in a parlour and by a robot) and hand milked. 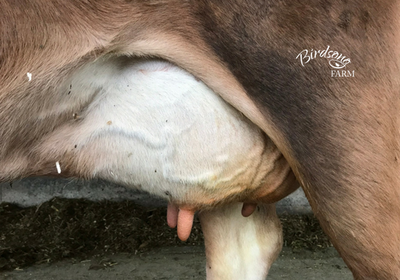 Her front teats are 2 inches in length and her back left teat is 1.5 inches in length, so a nice size for hand milking. 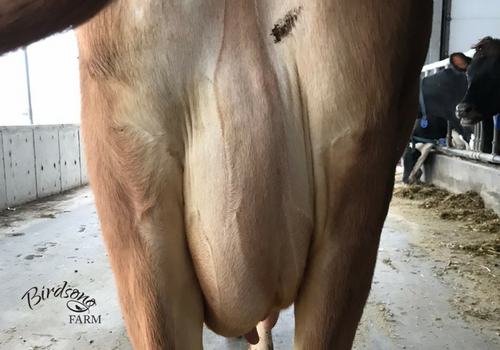 Lexi was placed on official milk test at the beginning of this lactation, and at 97 days in milk she has produced 2,277 kilograms of milk (1 kilogram = 1 liter) at 4.3% butterfat and 3.9% protein. Alexandra's milk production peaked at 32.5 kilograms, 31 days after calving. 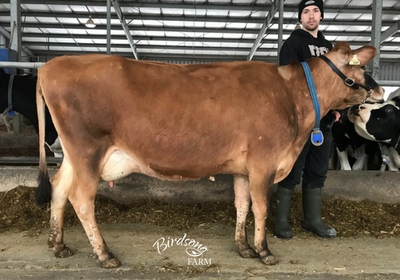 She is currently producing 18 kilograms a day (115 days after calving; based on a 7-day average). Please click here to view Alexandra's publishable lactation summary. 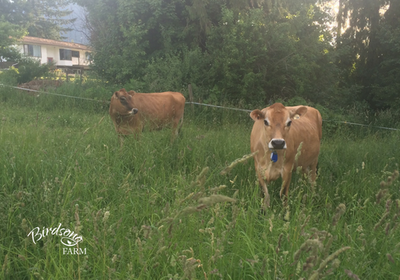 ​Alexandra should be dried off by July 16, 2018 for a 60-day dry period prior to the birth of her third calf. ​Beta Casein - milk yield and protein content. The A2 variant has been shown to have a positive association with milk yield and protein content. The A2/A2 genotype is also considered to have positive effects on human health. Kappa Casein - protein yield and percentage. The A variant and AA genotype are associated with higher milk production. 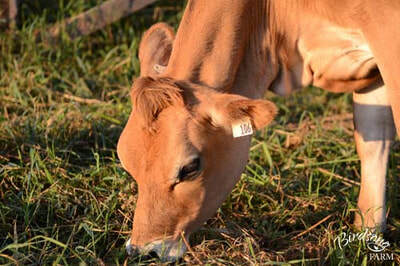 The B variant and BB genotype are association with increased milk protein and casein content, and better cheese yield. Relative to protein content and cheese production, BB is the most favourable genotype, AB is intermediate, and AA is the least favourable. 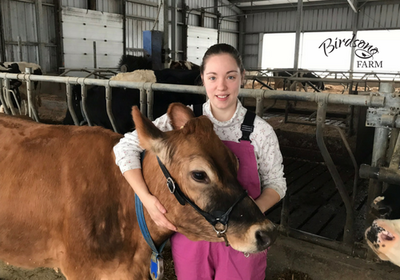 Genetics: I tested Alexandra with the 150K genotype panel (CDN15323661) and she has a Direct Genomic Value (DGV) of 946 and Pro$ of $230 (17*Dec, 56% reliability); please click here to view her genomic evaluation details. In addition, Lexi is tested free of Jersey Haplotype 1 (JH1) and Jersey Haplotype 2 (JH2). 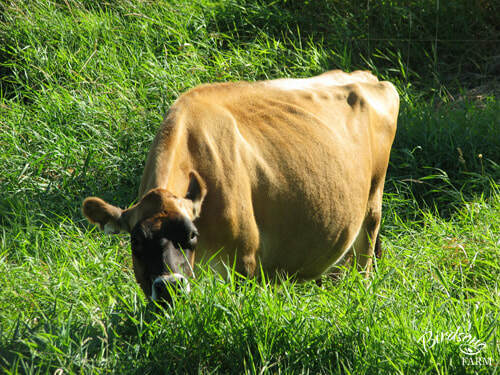 Classification: Alexandra was classified as Good 77 (G 77) at 2 years and 8 months of age, 213 days in milk. ​I hoped to classify her again after Marina was born, but her score could not be raised due to her blind quarter. Please click here to view Lexi's type classification summary. 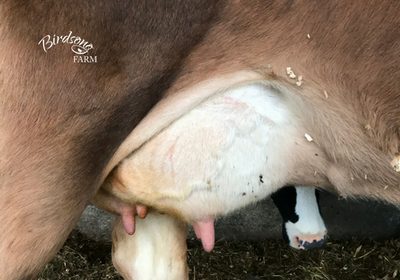 Alexandra's dam, Sonja, was classified as Very Good 85 (VG 85) and her older sister, BIRDSONG PRINCESS GRACE is Good Plus 84 (GP 84). Prizes: I enjoy taking my heifers and cows to the fair, and took Alexandra to the Interior Provincial Exhibition & Stampede in Armstrong twice. She was 4th place Junior Yearling in 2015, and 4th place 2-Year-Old in 2016. Her dam, Sonja, was 4th place Junior Yearling in 2011, 5th place 2-Year-Old in 2012, 2nd place 3-Year-Old in 2013, 3rd place 4-Year-Old in 2014, 3rd place 5-Year-Old in 2015, and 4th place Mature Cow in 2016. Sonja was a key part of my Breeder's Herd as well, which placed 3rd in 2013 and 2014, and 4th in 2015 and 2016. Lexi's older sister, Grace, was 3rd place Junior Calf in 2013, 1st place Junior Yearling in 2014, and 3rd place Junior 2-Year-Old in 2015. 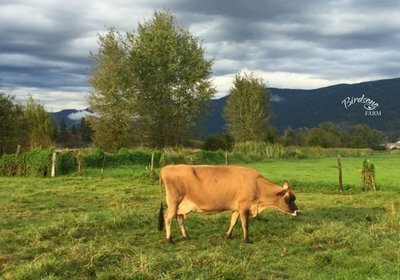 I entered her in the North Okanagan Spring Show in 2016, and she was 3rd place 3-Year-Old. Health: I vaccinate my cows annually with Covexin Plus and Triangle 5. Alexandra was vaccinated in September 2017, 3 weeks before her due date. I usually give all my Jerseys a magnet when they are breeding age in case they eat a nail or other sharp piece of metal. I was a little delayed with Alexandra; she received her magnet in January 2018. ​Alexandra was given a Transition™ Calcium Bolus following the birth of her second calf to prevent milk fever. A calcium bolus is recommended for all mature cows (second calf onwards) to prevent milk fever. Lexi has a history of breeding back easily. This pregnancy is a perfect example of this--she got pregnant with the very first breeding! 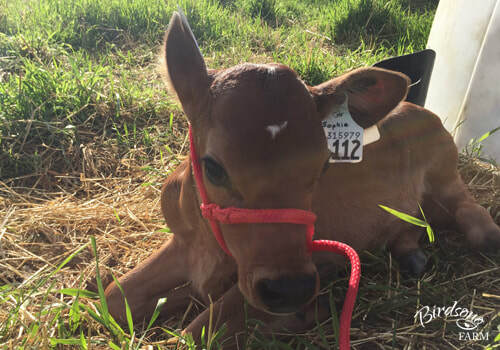 Covexin® Plus is a killed vaccine from Merck Animal Health. It is an aid in the prevention of disease caused by Clostridium tetani, C. chauvoei, C. septicum, C. novyi Type B, C. haemolyticum, C. sordelli, and C. perfringens Types C & D.
Triangle 5 is a killed vaccine from Boehringer Ingelheim. 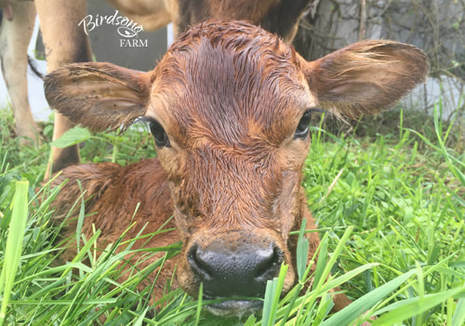 It is an aid in the prevention of disease caused by Bovine Viral Diarrhea Virus (BVD) Types 1 & 2, Parainfluenza 3 (PI3), Bovine Respiratory Syncytial Virus (BRSV), and Infectious Bovine Rhinotracheitis (IBR). ​Price: Alexandra is a very lovely mid-size Jersey. I am selling her because she's not a good fit on the dairy farm where I am boarding her, but I believe that she would make a perfect family milk cow. 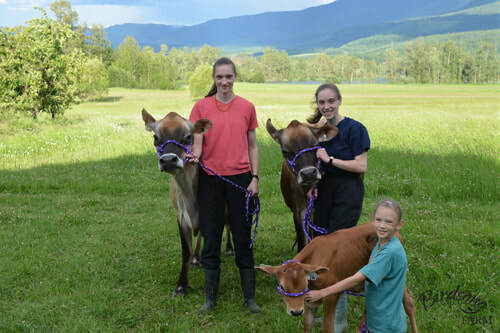 Alexandra was sold to Elaine & Al Dillabaugh from Montana Hill Guest Ranch in Bridge Lake, BC. Alexandra's granddam, Princess, as a 5-year-old cow. Alexandra's granddam, Princess, as a 6-year-old cow. Alexandra's dam, Sonja, as a yearling heifer. 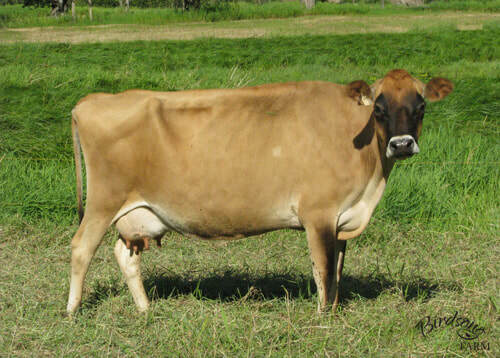 Alexandra's dam, Sonja, as a 6-year-old cow. 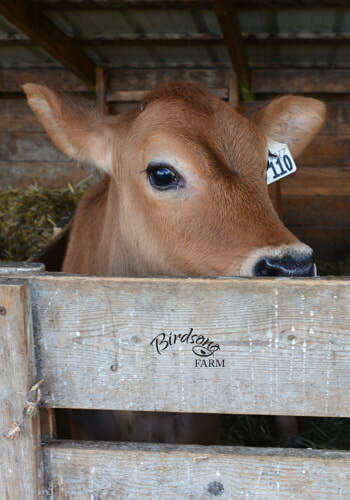 Alexandra's older sister, Grace, as a yearling heifer. Alexandra's older sister, Grace, as a 2-year-old cow.